St Mary's House, The Close. My introduction to Lichfield’s underground world came a couple of years ago, on the thoroughly enjoyable Gruesome & Ghostly City tour. Then, back in January 2011, there was a series of great posts on TamworthTimeHikes about underground mysteries in Tamworth. As a result, information came to light (sorry! )about tunnels in Lichfield and Mark kindly passed the information on to me. Since then, tunnels have resurfaced several times (sorry again! ), most recently in conversations with Vickie Sutton, Brownhills Bob , the folks at the BeaconStBlog, and as you may already have seen, in the comments section of the Monks Walk post. So, I thought I should finally get around to doing something on them! Here’s what I’ve heard/read/speculated about so far…..
My first tunnel! Standing on the corner of Sandford St on a chilly October night we were told that tunnels led from that area to the Cathedral. In recent conversations on the Monks Walk post, ‘Born a Lichfeldian’ has contributed more to the story of the tunnel, suggesting that the tunnel also runs to The Friary. You can read the discussion here. In a book ‘Lichfield & its Cathedral’ by H Snowden Ward (1893) is the following description “From the cellars of the inn, an underground passage ran some distance and was popularly believed to terminate as St Chad’s Church. That is went so far is extremely unlikely, and what was its object or termination will never be known, for a few years ago the late owner of the White Hall caused the portion under that house to be filled up, and without having the passage explored through its whole length”. City librarian & historian J W Jackson (who I’ll introduce you properly to another time) noted in his weekly history column in the Lichfield Mercury of the 1930s that the tunnel under White Hall was dug out by a previous owner during the plague. Presumably he wished to go about his business without soming into contact with carriers of the disease or the bad air that some thought caused the plague at the time. Would be interesting to see if there are stories of any tunnels elsewhere being dug for this purpose? In the Lichfield Records Office there is a copy of Lomax’s Pictoral Book of Lichfield, edited by Alan J Bull. 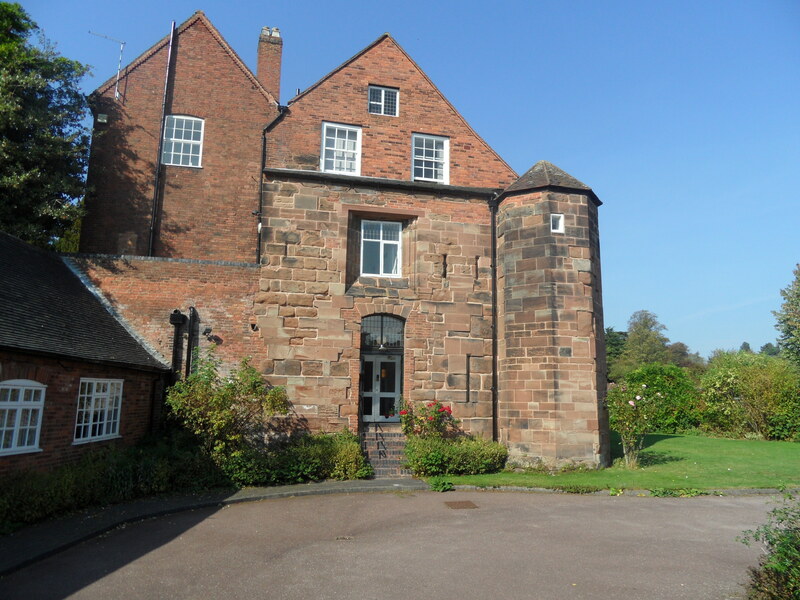 It describes St Mary’s House as the oldest house in Lichfield and says that the East & South walls are part of the original building which dates back to before 1321 and formed part of the Close’s defences – at the base the walls are 6ft thick and you can still see the arrowslits. The book goes on to say that tradition has it that below this building are underground passages leading to St Chad’s, White Hall, the Friary, St John’s Hospital and the Old Brewery on Sandford St.
Vickie’s Aunt remembers seeing a very large tunnel somewhere in the vicinity of Beacon St, which she describes as being whitewashed and large enough for a coach & horses to get through. A rumour of a tunnel behind a building on Greenhill, which used to be a pub called the Spread Eagle. (You can still see the archway for the coaches & the building is called ‘Spread Eagle House’). As well as discussing tunnels, I’ve also been talking to people recently about the importance of stories & legends, like these. Do we really need to get to the truth or should we leave them be & enjoy them for what they are? I still haven’t made my mind up, so, I’ll leave it for you to decide in this case. Therefore, this next part is a bit like a Choose your Own Adventure book (remember those? I used to have my fingers bookmarking about 5 different options at a time!). If you would like to investigate the truth behind Lichfield’s mysterious tunnels you could start by clicking here or exploring some old maps of Lichfield here. Just suggestions though, can’t guarantee you’ll find the answers! I’ve been told about another tunnel by someone on Twitter – one between Gaia Lane and the Cathedral. Apparently it leads to a house that used to be used as a laundry/servants quarters. A relative of my tunnel informant has actually been in the tunnel, and says it is blocked off. We’re thinking laundry tunnel, servants passage – anyone else know anything? Interestingly there was a daughter and mother, Ellen Stone and a Mary Skelton, both described as a ‘Laundress’ living at Gaia Lane on the 1851 census. Going off topic somewhat, Ellen’s son Henry lived with them. He was illegitimate and there is some interesting speculation on who his Father may have been. You can read more at the Stone Family History site here. I’ve come across a scribbled note I made some time ago which says there is a tunnel underneath Farewell Church. Interestingly, there is a work of semi- fiction set at the nunnery that preceded the church. The story is set at the time of the dissolution of the monasteries and is called ‘A Tale of Fairwell’. The last scene of the book is set in ‘the subterranean vaults of Fairwell Priory’. Also, Hanch Hall has a confirmed underground passage of some description – the listed building description says there are ‘extensive brick vaulted cellars with vaulted passage or drainage channel leading into the park’. This entry was posted in Beacon, Cathedral, civil war, Dam St, Friary, haunted, Lichfield, maps, The Close, tunnels and tagged legends, Lichfield, tunnels by Kate. Bookmark the permalink. I know an ancient conduit runs from Aldershawe hill to the conduit in the Cathedral Close. From sketches i’ve seen in a book it was quite a large tunnel cut through the sandstone. Check out History of the Lichfield Conduit Lands Trust its all in there. I have found the one you are talking about in Maple Hayes. Its quite easy to find, its on the border of Jubilee Wood and a field that has loads of newly planted trees in. Theres another small ruin in the woods which was built in the 18th century. I know! Imagine that happening amongst all of the pomp & ceremony! I see South Staffs have their own archives, wonder if they have any photos from that day. Did you see the bits about the plans to fill in Minster Pool? Well done, you have started something with the tunnels discoveries that I have been waiting for over a long time. Lichfield has a large amount of tunnels beneath the City. Many were used as escape route during the English Civil War which I had always been told were dug by miners from the Cannock area. Although on the North side of Lichfield there are tunnels a long way down which are from the Lea Hall Colliery, not the same ones. There is a tunnel from Dr Milly’s Hospital on Beacon Street. The person who mentioned the tunnel in Beacon Street is right about the tunnel being wide enough for a Coach and Horses, but this is part of a much longer tunnel. The chaps who mentioned the tunnel from near Maple Hayes are also correct. The tunnels generally had stop off points at different establishments so there were more than one escape point off each tunnel, good old military tactics, don’t have all your eggs in one basket! Although some historians and archaeologists have studied some areas of Lichfield over the years, there is no conclusive mapping of all the tunnels! It’s something that lots of people are interested in, fascinating stuff. See the update re. Gaia Lane? I’ve read about Cannock Miners being used to tunnel under the Close’s defences and using gunpowder to blow them up! RE: Gaia Lane tunnel- I think it was well over 30 -35 years ago when the allotments were up and running I seem to remember a tunnel under the alley way which leads off Gaia Lane down to Lichfield. My memory may deceive me though. That’s interesting. Might be worth having a little look to see if it’s still there, you never know! The House next door to the George and Dragon Pub (right hand side as you face it) has a bricked up circular hole in the floor of the cellar. It could be an old well. Some friends about 15 years ago entered the Tunnels on Beacon Street and reached the Catacombs of the Cathedral. I spoke with a man a few years ago who carried out archeological digs at the Friary and the Cathedral – unfortunately he was suffering the early onset of Dementia. He said There is a Tunnel at the Rear end of the Cathedral that leads into the grated culvert at the Dam Street End of Minster Pool (I assume this culvert is to feed Stowe Pool). 20 or 30 years ago – this tunnel was like new according to him. This Tunnel has a vertical drop at the Cathedral End (from the first or second floor)- so it may have just been for “Slooshing out” the holy piddle pots, rather than an escape tunnel. The Skulls had holes smashed in them and they were under the walls foundations about 10 feet below ground – they didn’t have time to remove them or investigate further. About four years ago, the road in Wheel Lane collapsed – there is a large under ground water culvert there – that’s a good reason to stay out the tunnels. They aren’t safe. Thanks for all of this information, both about the tunnels & about the friary. I absolutely agree with you about staying out of any tunnels, could be extremely dangerous. When I say investigation what I really mean is research and as I mentioned to someone else maybe trying to pull together some sort of map with all of the information that’s emerged so far would be a good first step. I have read with interest, the comments made, about the various tunnels, beneath, Lichfield. I was a pupil, in the 1950’s, at what then, was called, Lichfield Friary School. There were at least two, connecting cellars, beneath the old, original part of the building, and l have been down in those, on several ocaissions, and l had heard the tale, then, of a tunnel, from those cellars, which was said to run, to the Cathedral. I have seen, a blocked up, entrance, to what could well be a tunnel, in the wall, of one of these cellars. The only thing, that l thought was strange, was that this was on the side of the building, which faces, towards, the clock tower, and would not, be the most direct route, to the cathedral. There is what appears to be an escape tunnel in the cellar of my home near Handsacre. A potholer has recently been down to investigate but after about 30 metres found the tunnel blocked off and converted for drainage. I think this was probably done in Victorian times when an extension to the main house was built. I have heard that there were a network of escape tunnels in the area, joining I believe to the Angels Court Hotel, Lichfield which is perhaps 4 miles away. It makes no sense to me that a tunnel from our house all the way to Lichfield would be viable – but if there were a network of tunnels? I have no proper information though. I wonder are there any comments. I am not an expert but looking at it you couldn’t imagine it as anything but an escape tunnel. It is very well constructed and in best condition. It may of course only go a short distance and simply connect to the local countryside though I know not where. It is possible it may be just drainage but I would be surprised if that were so. More interesting if it was part of a tunnel network. I have heard others describe other similar tunnels in the area. I will try and revisit these sources and see if I can document them more carefully. That would be great. It seems there may be a whole subterranean world underneath Lichfield and the surrounding area. I think it would be great if there was a kind of mass investigation by local people. I’m not suggestion we all meet up in the Horse & Jockey with torches & go all Indiana Jones of course but more like a big discussion to see what people know, what stories are out there and then see if we can get any answers. As you’ll see from other comments there are a couple of interesting underground projects around the country – why not the Lichfield area! Kate, I think Tony Robinson may need to be called in for this one too. It would be really nice to find out the truth. A Time Team week in Lichfield to investigate a few archaeological sites, how interesting that would be! See my answer to Taff above too! Just a wild idea at the minute but if we could get something going for the heritage weekend it would be brilliant. They just did a community dig in Polesworth this summer & I know of one planned for somewhere else nearish in the not too distant future. Again, why not Lichfield! “I’m not suggesting we all meet up in the Horse & Jockey with torches & go all Indiana Jones”…shame, that sounds great fun! Think I’d need a pint or two of Golden Glow to give me a bit of courage first! This stuff interests the hell out of me! Thanks Mike. I’m working on an idea to hopefully get people involved in discovering more about the tunnels and bringing all of the stories together. I agree, ive recently been studying / listening to rumours about these tunnels! Apparently they is an entrance to one in the cellar of boots in the city centre which is ‘supposedly haunted’. Thanks for the comments! I’m currently working on creating a map where people will be able to share & discuss their underground stories. This could then form a basis for further research of the stories or in the cases of cellars, we might even persuade some of the places to let people in to have a look…….More information to follow shortly but if you would contribute to that as well that would be fantastic! Fanning, Manager of the Kings Head Inn, Bird Street. He introduced me to several of the monks living there. One of them took me into the grounds and showed me the entrance to a tunnel which he said went all the way to Lichfield Cathedral. He said that because of the distance, there were quite a few exits and entrances along the way. Some time later, about 1954, I went to St Marys’ Vicarage with ‘The Girls Friendly Soc.’, we were taken down to the cellars and shown the start of the tunnels there, said to travel miles, and be like the Catacombes in Rome, as in you could get lost down there. I often think of these tunnels and wonder when somebody will get round to looking into them. Thanks so much for the info Lesley. I was just having a look at Hawkesyard Priory following your comment and noticed they say this on their heritage page ‘Mary Spode, widow of Josiah Spode III, bought the Estate in 1839 for her six year old son Josiah IV, great-grandson of Josiah Spode and the Hall was much altered and extended. The intricate cast iron Orangery was added, along with the beautiful manicured gardens, statues and other outer buildings. Six underground tunnels were constructed to allow the Estate workers to move quickly around the locality, two of which led to Lichfield and Armitage’. Absolutely incredible. Hi all, I too have always been interested in the Lichfield tunnels, who remembers Garratts Bakery now the Arcade opposite Wilkinsons, when the bakery was demolished circa mid 1960’s I seem to remember tunnels were found then and rumours have it (I say this as I have no proof) that some Lichfield tunnels went out as far as Wall on the A5. Anyone else heard of this? Thanks Bill. That’s a new one to me so it’s great to hear! I might have a little look through the old papers at LRO to see if there was ever anything about this in the Mercury…. they may not count as tunnels, but there’s a load of underground passages that can be reached from a car park (its kind of down a slope and through an arch) by the Angel Croft Hotel. as a teenager I would spend hours down there. even going as far as buying a tilly lamp. there is a set of stone steps that, we believed, led up to the Hotel itself. my mates dad owned the hotel at the time (Hilpert) but he didnt know. Also there’s a strange gravestone in a farmers field out over Leamonsley. I’d love to hear more about the strange grave stone and where exactly it is. I don’t know if you saw, but on another post (The Grave of Poop Bessy Banks) I was just discussing unorthodox burial practices with someone who has done some research into the subject. The Hanch Tunnel is a man-made tunnel that was constructed in the Triassic sandstone to the north and west of Lichfield in the 1850s. When first constructed, the tunnel was connected to Minster and Stowe Pools, which served as storage reservoirs for use during times of water shortage. These connections are now blocked and there is believed to be no remaining connection between the tunnel and the pools. The tunnel was also used to transport groundwater from Hanch Reservoir (now abandoned), and then from Seedy Mill boreholes, to Sandfields, where the water was abstracted and treated before being used to supply Lichfield. Some time around 1996 I was able to go down the Hanch Tunnel, there is an entrance near to Becon Park. It was quite an interesting circular shaft about 20ft (7m) deep with a spiral staircase cut into the wall. You could look up the tunnel in both directions; I think it is about 5 km long. There are a few pictures on my blog, courtesy of an ex-employee of the water company. I have just read your posts on Lichfield’s tunnels. I live in Whitehall, we have the end of a tunnel. The tunnel is much older than the house, Whitehall was originally the ‘Coach and Horses’. The Coach and Horses and stabling were built on top of the tunnel. The tunnel originally could only be accessed from the outside and not connected in any way to the property. It was blocked off many years before we bought the property – 20 years ago. The previous owners told us the Channel 4 had filmed a documentary about the Civil War, and filmed in our tunnel (before it was sealed- I believe) as it was meant to be one of three tunnels that were ‘bolt holes’ for the clergy during the Civil War. We were apparently outside the city walls at this time. This tunnel is a substantially built structure, 20 feet across brick lined, and certainly goes in the direction of the cathedral. I did quite a lot of research when we first moved, in the library archives and at the cathedral. The cathedral gave information on the three tunnels and confirmed the one from the cathedral came to us. I’m fascinated by it all as well. Hi, I used to do a fair bit of urban exploration and was lucky enough to explore sandfields pump station, the angel croft hotel and various other places in the lichfield area. I used to regularly get tunnel fever and spent a lot of time researching the possible entrances to various tunnels. In particular I’m pretty certain i know of at least two entrances to the tunnel supplying water to sandfields which is supposedly navigable in a rowing boat and stretches for about five miles from the pump station to handsacre. Sorry – also meant to say im pretty sure I k ow the route of the tunnel so I guess other hatches could be found? I love urban exploration, although I am not brave enough to do it myself, so I have to enjoy other people’s explorations vicariously! Amongst other things, I think it’s a really valuable way of recording our past, especially those buildings that are at risk like the Angel Croft. Dave Moore who has a blog on Sandfields Pumping Station has been inside the Hanch tunnel & there are a few photos. Cheers! Really interesting discussions. Have you got any further with producing a map with all the Lichfield tunnels on it? I work at Stowe House and for years there have been stories of tunnels leading accross to St Chads Church and beyond. Yes…and no. Will dig out what we did but might be time to resurrect it! I have always heard and been interested about the tunnels going from the Cathedral out under Lichfield. I used to work in the Cathedral for a while and they have so many rooms and areas underneath the floor level but I wasn’t lucky enough to be shown any tunnels. Surely with todays technology someone can map it from above ground? Nottinghams caves have been done so why not the tunnels? I know that this would cost a lot of money but it would be great to get someone interested in doing this just to prove how many and what they were used for. HI Mandy & Fiona, I’ve recently been contacted by someone from the Newark hidden history group who are doing something similar. I’m hoping to meet up with them soon to find out how the got going. I am really keen to get a project going on the underground spaces in Lichfield as I know there is so much interest. Watch this space! What interesting posts on such an interesting subject.Would love to be involved if any groups are started up. hi, i may be a little help here i use to live in one of the 3 properties called “whitehall” on beacon street and can confirm that under the main staircase they may have being access to a tunnel but it was filled in with concrete back in 05/06 when i lived there.Also my friends brother lived in the 3rd property(last an old hotel chopped into 3 rented properties) and he had a hatch in his living room floor with 2 rooms below id say about 6-7 ft in height. The hatch gave you access to the other set of tunnels that were by the building in the top left..doubt there flooded though as they are just so big n width and height based on my memory..from what i heard at the time just after my last visit in the hatch had being locked up easy to get in though id guess and the drop at the back had maybe being filled in only because someone/business had access granted to use them as wine cellars so id say they are definitely not flooded, i guess two sets of tunnels sat next to other was just a coincidence but the bigger ones were beautifully made that old stalactites formed on the ceiling..rumoured catacombs down there and from a few chunks in a far rooms walls facing the cathedral someone had being looking for them at the time,this memory is now 13 years old but i do remember the tunnel so clear i used to work at tudor cafe at 15 too and can say the tunnels in the top left matched the ones there looks wise hope this helps! p.s its the tunnel(s) under stowe pool which collapsed. How interesting! I went into the cellar at the tudor but didn’t find any tunnels. Want to go back for another look now! I was always sceptical of the expanse of reported tunnels around the Rugeley area and been mystified by the lack of historical information on them. I used to live in Brereton and often played around the brook in Rugeley and on a number of occasions went into the first and second chambers of the Hagley Hall grotto. Friends reported that they had explored further and suggested at one time you could emerge on the small island in Elmore Park. Tunnels also supposedly connected to the Nunnery in Rugeley and went on to Spode House / hawksyard Priory. I’ve also been into the entrances of the tunnels at Hawksyard priory and again am told by friends they have explored them further and that they connect into the vaults of the church on the same site. Whilst attending the neighbouring Hob Hill school (a hob is an underground dweller, possibly a hermit, in this case one living at Hermitage or Armitage as it’s now called) a hole opened up in the hill adjoining the playground, this hole was the collapsed roof of a tunnel that appeared to be running towards the Hawksyard entrance and towards Upper Longdon. Between Hawksyard and Upper Longdon there is a very early drift mine, this may not be connected to the tunnels but highlights the fact that mining in the area is likely to make exploring any remaining lengths of tunnel extremely dangerous. There is also a cutting in the hillside from the back of Brereton (just past the drift mine) to Upper Longdon, that appears to take the same trajectory, interestingly if you view the cutting from any surrounding hillside you wouldn’t be able to observe travellers along this route (it’s possibly not man made but the route of an old stream). At the start of this cutting I have also seen two tunnel openings on separate occasions, possibly after collapses, that have later been filled in (probably by a farmer). I also understand there are underground structures Just behind Upper Longdon at Beaudesert Hall (Huntsmans Cave?) although I have heard little about these. I’m now wondering whether it would be viable that tunnels do actually carry on out to Lichfield and other surrounding areas.